The organic natural food market that I go to has no holiday decorations at all. 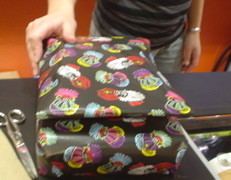 But they have wrapping paper, in case you buy something there for a gift. 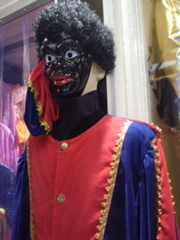 There's a costume shop near Grote Markt which sells this lovely Zwarte Piet clothes, wig and mask. I forgot to check the price. 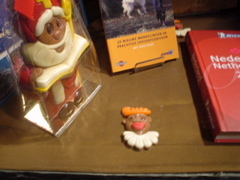 A primarily anglophone travel book store near Grote Markt had several Zwarte Piet candies as decorations in it's front window. 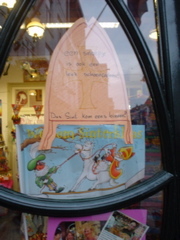 A very small toy store near Grote Markt uses chocolate Zwarte Piets as a part of its window display. 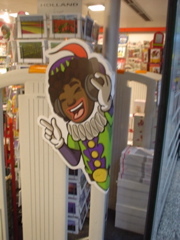 A gadget shop near Grote Markt has gift wrapping with images of Zwarte Piet, despite the lack of any sort of holiday decorations in the store. 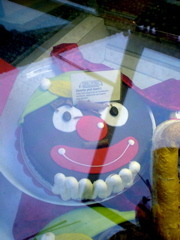 This Zwarte Piet golliwog appeared today in a store on the corner of my street. 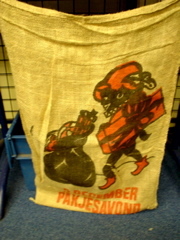 I thought perhaps Zwarte Piet would disappear after December 5th, but this makes me suspect that he will be here for the entire month of December. 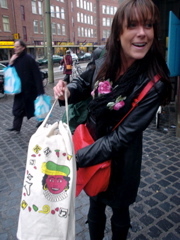 Woman in The Hague with a nice Zwarte Piet bag. 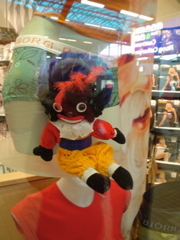 The clerk in an underwear store in Utrecht took my picture holding a Zwarte Piet from their window display, after I couldn't get a good photo because of glass reflections. 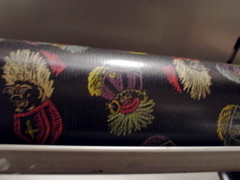 The clerk smiled the whole time and was very friendly. 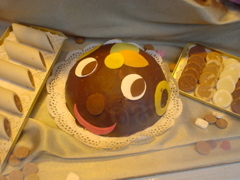 Jan de Groot bakery in Den Bosch is the most renowned and respected baker of Bossche Bollen. 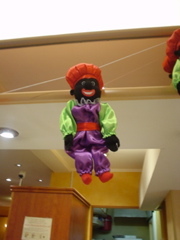 Their window display included this acrobatic Zwarte Piet, who flipped over the swing that he hangs from. In his right hand, he holds a switch, which he uses to beat naughty children before stuffing them into a sack and taking them to Spain. 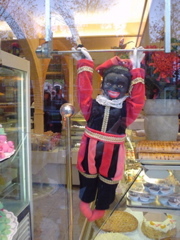 Their window display included this Zwarte Piet cake. 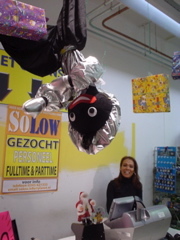 They had a line of Zwarte Piets hanging over the cash register. 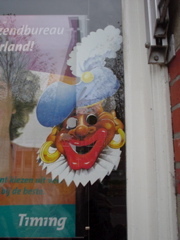 This Zwarte Piet was decorating the window of an employment agency in Den Bosch. 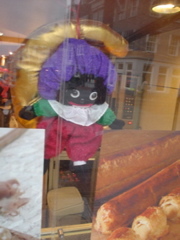 This Zwarte Piet hangs in the window of a bakery in Den Bosch. 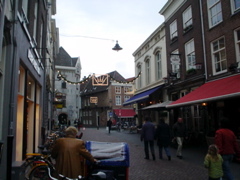 A street in Den Bosch. The strange lights hanging in the street is a version of the city's symbol. Cola referred to it as "The Lidless Eye of Christmas." heh. 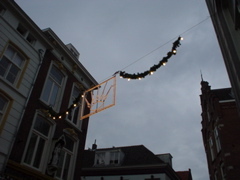 Christmas lights in Den Bosch. The shape is a version of the city's symbol. Cola referred to it as "The Lidless Eye of Christmas." heh. 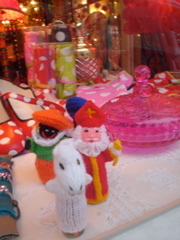 Finger puppets of Zwarte Piet, a white horse and Sinterklaas in the window of a kitschy shop in Den Bosch. 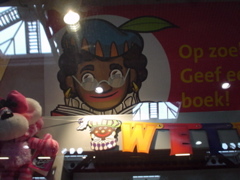 Zwarte Piet in the window of a book store in Den Bosch. 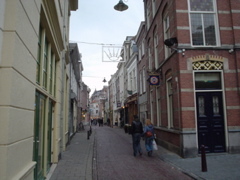 A street in Den Bosch. 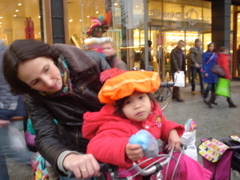 A little girl in a Zwarte Piet hat in front of the Bijenkorf in Den Bosch. 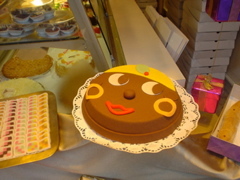 Two women in blackface, dressed as Zwarte Piet in the market in Den Bosch. 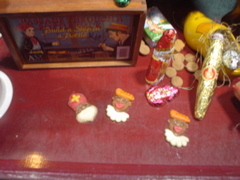 There were a few two person teams of people in blackface roaming the market handing out toys and candy to children. 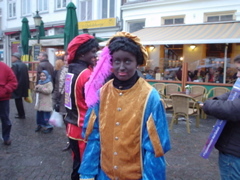 Two the left of the Zwarte Piet, you can see a hopeful child who has caught sight of them. A few moments later, much to her delight, they gave her a toy. 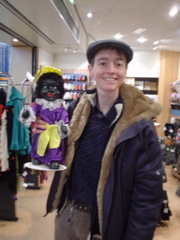 She was one of many very happy ethnic minority children who I saw them interact with. 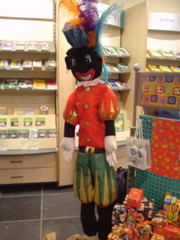 Zwarte Piet in the tourist office in Den Bosch. 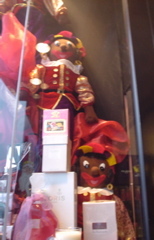 Some Zwarte Piet dolls in the window of a makeup and perfume store in Den Bosch.